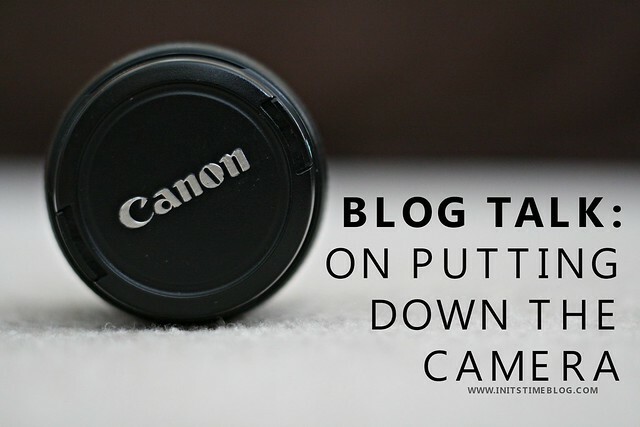 BLOG TALK: ON PUTTING DOWN THE CAMERA. I did something sort of unbelievable this past Thanksgiving--at least for me. So what did I do, you ask? I didn't take any photos. Yep, you read that right, No photos. Not even for my 365 Project (fortunately, there's leftover pie to snap a photo of or something). I didn't get too dressed up, I didn't spend a lot of time on my hair, and I didn't even think about blogging. And to be honest, it was one of the best Thanksgivings I've had in a long time. When I was talking to my mom after family left, I couldn't help but wonder why I felt so happy and so stress-free after Thanksgiving this time around. And I 100% believe it's because I didn't stress about the holiday. I realize this revelation of sorts is old school and something that we all know we should do. And I also realize that I was fortunate enough to not have to really host Thanksgiving or cook a lot of food this time around, which also probably helped. But I can't help but wonder if making this a bigger priority in my life would be better for me. I've been putting my camera down more and more and have actually found that it's been a nice break. At first, it was simply because I was short on time. But then, I just let my camera sit down on purpose (gasp, right?). And it's been a good change of pace. I still have cravings to take photos--where I'll see something so pretty (like a foggy field on the way to work) and wish I had my camera--but I've also started to see it as a moment that is to be enjoyed, not necessarily captured. It's been a hard adjustment, but also a good one. Because sometimes--just sometimes--we need to live in the moment instead of trying to capture every single one. So what do YOU think? Do you ever purposefully put your camera down? Do you ever take breaks from social media (or refuse to join certain networks) for your sanity? I have found that some of the moments I want to remember the most are when my camera isn't around. This year, I didn't take a single photo on my birthday because I was too busy celebrating. Yesterday my neighbor invited all the little girls in the neighborhood and their moms to a tea. I left my camera at home because I said I was just going to enjoy it. Of course, I walked in and saw all the little girls dressed so cute and all the decorations and then the light was hitting the oranges and banana just perfect and I was inspired. So I ran home (thankfully we were just next door) and grabbed my camera haha. Wow this is something that I struggle with, wanting to capture EVERYTHING. But you summed it up so well: "see it as a moment that is to be enjoyed, not necessarily captured." Sometimes I get to worried about getting the right picture or making sure I have my camera or phone available to capture the moment. This is a great reminder that it's okay to be in the moment without having to capture it. I didn't do a post today that I had planned. And I kind of don't care! Ha! And I'm thinking it might not get posted tomorrow either. We've been sick... and we decided to put our dog down this week... blogging just kind of is getting pushed. And I kind of like it! I totally agree with you! There are times when, even if I have my camera on me, I will forgo a shot because I'm too busy enjoying it. I agree with people who say taking a photograph is like capturing a memory, but I don't want ALL my memories to be from behind a camera! I'm glad you can relate! I've started to realize more and more that my camera was starting to cause anxiety and that I used to carry it with me just so that I could have it "just in case." What I've realized is that I need to really just enjoy the moment, even if it means missing out on a few cool photos. It's definitely a challenge, though! :) If you have any tips, I'd love to hear them! But I love that this time has really helped you realize that disconnecting can be a good thing. It's definitely something I'm still learning! I am so glad you can relate! Reading your comment had me nodding my head because those are my exact feelings. I realized that it was turning into an anxiety, where I had to bring my camera just to make me feel ready and prepared for that "just in case" photo! So it's definitely still a challenge, but something that I'm working on! A sort of "compromise" is leaving the nice camera at home but still having my phone on me in case I reaaaally needed to take a photo! I'm proud of you Kiki! I also didn't take any pictures over thanksgiving weekend and didn't post about it. I think not taking pictures all the time is seriously liberating. I'm all for documentation (obviously) but so,grimes you don't love in the moment if you're constantly taking photos with your blog in mind. Just I joy the day and love it! I love that you did this little camera down time experiment. I like what Leelee said: I was too busy celebrating. Sometimes, you just have to live in the moment, as you said. I've stopped bringing my camera to restaurants or small gatherings. It's hard to enjoy and interact when you constantly have a camera in your hand. I started to feel like I was "working" all the time. I agree with you on ALL of those things. As a photographer (or really, just someone who loves taking photos), I have a hard time admitting that there are times in life when the camera needs to be put down, but it's true! I actually have started to do the same thing with my camera--that is, leaving it at home for certain gatherings and outings. It definitely can seem like work (at least blogging-wise for me! ), that's for sure! And I LOVE that idea of having photography days. I've started doing that already on the weekends and love the concept of doing that as a regular thing and part of my routine. Thanks for that tip! Ooh, that must have been beautiful! I have yet to see a California beach sunset but I LOVE Pacific Ocean sunsets. :) I love that you all documented that moment and then decided to put the cameras down. That is a great compromise! I agree with you in that photos and photography capture moments and I do LOVE having photos to look back on, too. But like you said, sometimes life calls for enjoying the moment (and playing games and chatting!) then taking photos!